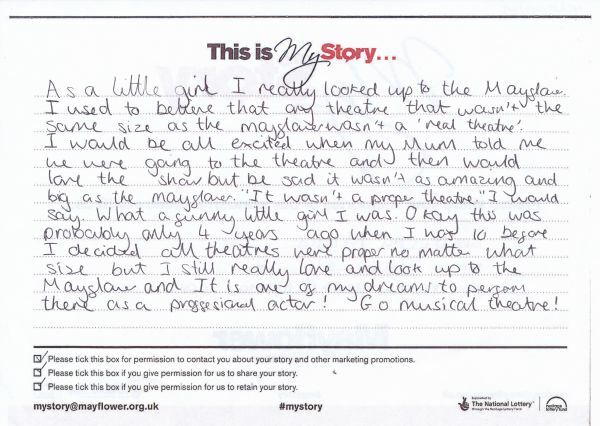 My Story card: Geena Morris remembers coming to Mayflower Theatre in her childhood. As a little girl I really looked up to the Mayflower. I used to believe that any theatre that wasn't the same size as the Mayflower wasn't a 'real theatre'. I would be all excited when my Mum told me we were going to the theatre and then would love the show but be sad it wasn't as amazing and big as the Mayflower. "It wasn't a proper theatre." I would say. What a funny little girl I was. Okay this was probably only four years ago when I was 10 before I devided all theatres were proper no matter what size but I still really love and look up to the Mayflower and it is one of my dreams to perform there as a professional actor! Go musical theatre!